Christina`s World (1948) by Andrew Wyeth- this, the artist`s most famous painting is part of the Museum of Modern Art in New York`s permanent collection and is NOT part of the exhibition in Mito. There ARE, however, many other pictures of the Olson House (top right) and of Christina herself (including some early versions of this famous painting) which shed light on this work and on the artist himself. Andrew Wyeth (1917-2009) is one of the greatest names in American art*. 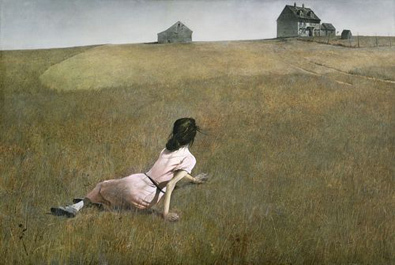 His most famous painting- Christina`s World (1948), can be said to be an American icon. His works, mostly realistic** depictions of people and landscapes, are in the collections of some of the most famous museums in the world- MOMA, the Metropolitan, and the Whitney in New York, the National Gallery of Art and the Smithsonian American Art Museum, in Washington D.C. (apparently some Wyeth`s also hung in the White House during the Presidency of George W. Bush***), the Palazzo Reale in Milan and the Hermitage in St. Petersburg, Russia. So I was more than a bit surprised to find out recently that one of the most important and interesting Wyeth collections in the world belongs to the Marunuma Art Park in Saitama Prefecture, Japan. In 1996, the director of the Art Park, Katsushige Susaki, arranged for the acquisition of 238 of Wyeth`s works- watercolors and drawings, in order to, as he has explained: benefit young artists and students of art in Japan. Through Sunday May 19th 2013, 80 of these works will be exhibited at the grand Ibaraki Prefectural Museum of Modern Art ( Ibaraki Ken Kindai Bijutsu Kan), located near the shores of Lake Senba (Senba Ko) in Mito, the prefectural capital. And though the artist`s most famous work, Christina`s World, is NOT part of this current exhibition, anyone who would want to gain a better understanding of that masterpiece (?) would do well to go up to Mito and see this show. The reason for this is simple. The Christina who is the central figure of that well known work, lived up in a big old house in Maine (seen in the top right corner of the painting) which Wyeth used to visit and paint every summer over a period of 30 years (culminating in a total of about 300 extant paintings of the house and life in and around it). 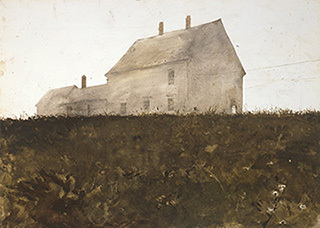 It is exclusively a selection of these paintings, focusing on that house, now known as the Olson House, and its surroundings, (now a popular pilgrimage site for Wyeth fans) which make up the exhibition now being held in the Mito exhibition- and they shed plenty of light (and shadow) on both his most celebrated single work and the artist himself. The biggest thing that I learned is a bit embarrassing for me to admit. Having grown up in New York and spent many a weekend hour at MOMA, I had seen Christina`s World countless times, but had never read anything about it- even the label. I had always seen the woman in the picture, sprawled out on the ground half propped up with her arms, facing away from the viewer and gazing out to a rustic old house in the background as a kind of Dorothy from the Wizard of Oz. I imagined a young woman full of yearnings and desires unfullfilled in the sterile environment in which she had to live. What I now know is that this Christina, as well as her brother Alvaro****, were featured in numerous Wyeth works- as they were the sole residents of the Olson House which was located near the summer home of Wyeth`s wife (the Olson`s ancestor was apparently one of the judges at the Salem Witch Trials). Wyeth seems to obssess about the siblings (Alvaro dedicated his life to caring for his disabled sister), and the house itself- which he examines in minute detail and sometimes brings to mysterious life. The first paintings have a bit of color (reflecting the beauty of the house as can be seen in photos and videos displayed at the exhibit), though the colors become grimmer and grimmer (to my eye at least) as the years go on and the brother and sister grow older and the old house more and more run down (while Wyeth grew richer and richer and more and more famous). The artist`s intense focus on this lonely household and the old building itself forshadows in some way (in my feeling) his later infatuation with Helga Testorf, a local elder care helper whom he painted in secret more than 200 times including (what I think are) some of his most powerful works. And there is one more thing that I would like to add. Though the works being shown in Mito are drawings and watercolors, Wyeth has created images with great detail- in a way that I thought could only be achieved with oils. It was with this technique, and his endless fascination with the family next door with all its dark details that help to create such haunting pieces- works whose presence I somehow feel more strongly now than when they were actually in front of me. The Ibaraki Prefectural Museum of Modern Art is located about 15 minutes walking distance from the Mito Station. When you go through the turnstiles after getting off the Joban Line train, turn left and walk straight- out of the station and then down the escalator (the same way you would go to get to the Immigration Office). Keep walking, cross the river (the Sakura, though a different on than the one that flows through Tsukuba) and then turn right at the traffic signal. Go straight. You will reach the museum in about ten minutes. You can`t miss it. On the way you can stop and see the swans, ducks, fish, and turtles in the river. 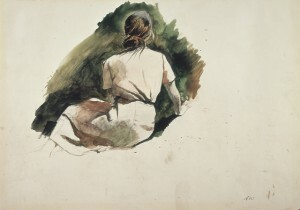 ** Wyeth himself might have prefered to have his style called Magic Realism. *** Now you have the idea of what type of people are big Wyeth fans! **** Just to show you how little serious critics are interested in Wyeth, the MoMa lecturer who talks in the link I provide above mistakenly describes Christina as Alvaro`s wife! Listen!